It’s true. The technology found in the four wheeled world is starting to take hold in the two wheeled one as well. It stands to reason because the standardization of airbags in the automotive world has helped save many lives and significantly cut back the number of injuries to drivers and passengers. Using a shoulder belt and airbag system in a car prevents serious head injury by 85% in front end collisions compared to 60% using only the shoulder belt. Obviously there are no seatbelts on bikes, but at least the same 25% improvement is gained on a motorcycle equipped with an airbag like the Honda Goldwing. 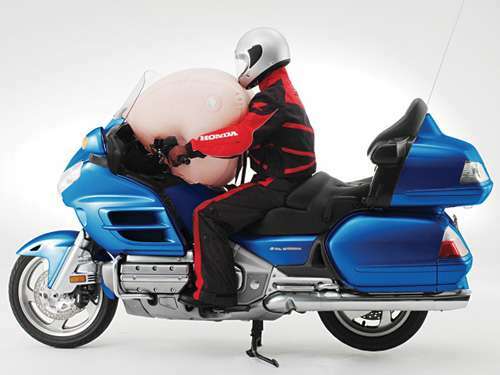 In 2006 Honda implemented an airbag in the Goldwing model lineup. Being that the majority of motorcycle collisions happen head on, it’s a great thing to have on board. Many riders are injured in collisions when crashing through the tall windshields found on not just motorcycles but snowmobiles and quads too. If these machines came equipped with an airbag like on the Goldwing it would likely help prevent that from happening and significantly slow the velocity of the rider if they happen to fly forward off the machine. That was the main goal of Honda in engineering this feature. To this point it’s still only Honda putting airbags on bikes. The added weight and cost may be the sticking point for other builders, but I’m only guessing. What other builders like BMW and Ducati are advancing and implementing is an airbag system worn by the rider as a vest, jacket or full length racing suit. Unlike the motorcycle mounted airbag which is only effective in a frontal collision scenario, the rider worn system provides the same degree of protection regardless of how the rider falls off the bike. This product was first developed and patented back in 1976 by a Hungarian inventor named Tamas Straub for motorcycle and equestrian purposes. His patent expired at the end of 1980 with little or no market interest in either area. From there nothing happened until 1995 when a Japanese company, Mugen Denko started research and development on an airbag jacket design culminating in the release of the first Hit-Air system in 1999. Several other brands have come about other than Hit-Air since and are widely available in Europe now, while the North American market is only just starting to get in the game. The design and system Denko came out with works basically the same way the one Tamas Straub designed long before. Initially there was even a legal challenge from Straub, but in the end nothing came of it and Hit-Air sales flourished. Timing is everything I suppose. Their vests and jackets are used by many police forces across the globe because the simple system really works well. There is a racing specific system available and also a street riding system. The difference between the two being how quickly and easily the system deploys since much higher speeds are reached in racing comparatively. One half of the connector or tether is anchored to the bike frame while the other is on the end of the ball release valve for the CO2 cartridge. There’s a quick release catch between the two sides of the tether allowing the rider to easily couple or uncouple from the bike. When installed correctly the tether provides enough slack to allow a rider to stand up on the foot pegs in order to mount or dismount without putting too much strain on the tether and activating the airbag system. The ball style end on the tether allows freedom of rider movement in any direction while the tether is attached. It takes about 60 to 66 lbs of force on the tether to trigger the air valve and send gas into the airbag tube, so it’s not easy to accidentally deploy. If a rider dismounts with the tether still attached it will simply remind them with a tug to uncouple, or in the case of a very light bike possibly pull it off the kickstand. When a rider does fall off the bike the release valve activates and the air bag fills completely in a claimed 0.25 seconds. This should mean the bag will be completely inflated before the rider hits the ground. In a case where it doesn’t fill completely first, Hit-Air claims even partially inflated the system will protect the rider well. Independent tests by several police forces measured results of below half the acceptable crash impact force limits for European regulations set at 3500 Neutons. Meaning there’s very little chance of serious injury in a crash where the rider is wearing this air bag system. After deployment the CO2 cartridge will need replacing with a full one, the release tether re-attached and the outer shell inspected for damage to determine if it can be reused or not. If there’s no significant physical damage the rider is good to go again right away after the gas charge slowly deflates from the tubes. 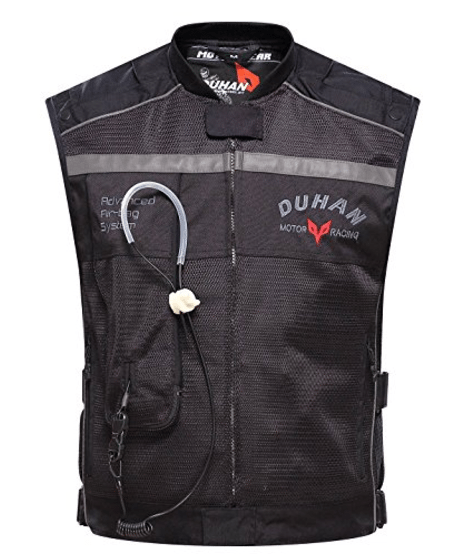 One advantage the vest has over a jacket is that it is more likely to be used every ride because it’s light and hardly noticeable to wear compared to a heavy leather jacket traditionally worn by riders. When the weather gets really hot , many people ditch their heavy jackets and ride dangerously exposed to stay cooler or even just suntan. Those who unwisely choose to do that may still be open to at least wearing the Hit-Air vest and so will have some degree of protection in a fall. Not that I’m encouraging anything less than all the gear all the time, but I know many riders think differently. 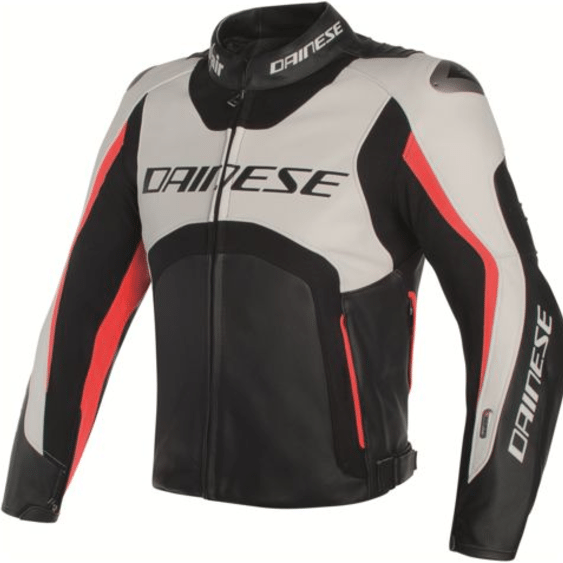 Italian riding gear giant Dainese is known as a world leader in producing the highest quality riding gear and they currently make the most advanced airbag systems available on the market. In the early development days electronics were used to pair airbag vests and jackets to individual motorcycles, or for certain models but this was too restrictive for Dainese and so they have moved ahead with much more flexible options now. The current D-Air technology uses sensors, GPS telemetry, accelerometers, gyroscopes and a microprocessor using a sophisticated algorithm to sense a collision or fall, then appropriately deploys the airbag system to protect the rider from injury. This system checks 1000 times per second whether or not the airbag is needed and when necessary can inflate the bags in 15 milliseconds or at slower speeds to better match the type of fall sensed. It can decide quickly not to deploy the system at all when speeds are lower than 10 kph and the extra protection isn’t needed, but if the rider starts tumbling afterwards it can and will react quickly to deploy then. The algorithm can distinguish a high side fall from a low side one and respond appropriately. They call it “intelligent clothing”. 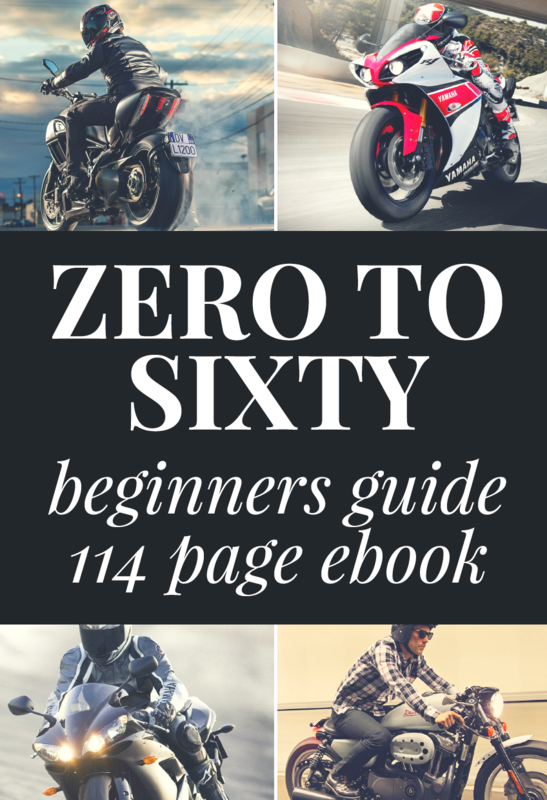 Even better is that the latest system doesn’t require a physical tether or any electronic coupling to the motorcycle being ridden whatsoever. The user doesn’t even know it’s there until they need it and can move from bike to bike without any concern. Powering the system is a lithium polymer battery that can go 8 hrs continuous before needing a recharge. Sitting idle the battery needs recharging every two months. The system is equipped with an LED battery life indicator. The GPS also records lap times, top speed and other performance data and stores it in the on board memory where it can be retrieved later if desired. The D-Air system is so effective that Dainese claims a 90% drop in the force felt by riders in the shoulder area over wearing only traditional composite body armour. The airbag is built in such a way to guarantee uniform inflation and complete protection of the upper body. This is significant as collarbone injuries are very common in bike crashes and sometimes it’s the full face helmet impacting the bones causing the damage. The D Air system specifically addresses that by putting composite shoulder caps and spine protectors in the jackets and full race suits. When combined with the airbag chambers under the caps it supports the neck and protects collarbones significantly. The D-Air system has received a lot of recognition from safety organizations and racing regulatory bodies even for earlier less sophisticated systems which came out starting in 2000. So much in fact, that MotoGP has made airbag use mandatory in races starting in 2018. To help accommodate that, Dainese has offered the D-Air technology as open source to other racing gear manufacturers to use under their suits. This elaborate system is integral to Dainese street jackets or racing suits in order to have maximum protection, so maintenance and repairs even to just the jacket can’t be done by the owner to avoid compromising the airbag system. If you’re thinking all this technical wizardry will be hard on the wallet, you’re exactly right as the jackets will cost you $2500 to buy or a full racing suit $3000. If the system deploys it must be sent away each time to Dainese to be recharged and repaired which according to some reviews I read can take months and cost between $600 and $1200 because it has to be shipped to Italy. **Update** Dainese has set up a couple of repair facilities in North America now which should cut down repair times to a matter of weeks at the most. Additionally, every 5 years the unit must be overhauled by Dainese at the owner’s expense and there are no loaner jackets or suits provided while your gear is away being serviced. Despite the expense there really is nothing better than D-Air’s system at this writing when it comes to protecting the rider as effectively. When installed in a high quality Dainese jacket like the Misano 1000 it’s hard not to like and feel true peace of mind. Only two options are available in street jackets: the leather Misano 1000 jacket and the Gore Tex Cyclone. Lurking in the weeds watching and learning from Dainese and its D-Air system has been their main competitor: Alpinestars. They have been carefully designing and testing their own airbag system called Tech-Air in the racing world since about 2011. Alpinestars have come up with their own excellent system on the track and a street version is set to be released in North America August 2017. Protects the upper body in all the same areas just as effectively according to test results by implementing composite armour in concert with the airbag. 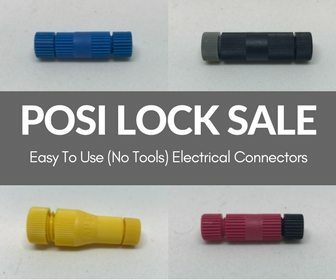 Cost to buy the system is roughly the same being estimated at $2000. Dainese has taken legal action against Alpinestars with regard to the design of the airbag chamber design which allows uniform inflation in Tech-Air just like D-Air. Dainese claims their technology has been copied while Alpinestars denies it. Both sides are standing their ground and the lawsuit is ongoing at the time of this writing. The airbag system is contained not inside a jacket, but in a separate vest which is installed in one of the two compatible Alpinestars jackets. This is a huge benefit in that damage to the jacket doesn’t affect the airbag system. Equally important, deployment or damage to the airbag unit doesn’t mean you are stuck without a riding jacket while the system is recharged or repaired by Alpinestars. You can also purchase a second airbag unit to protect yourself while you wait for the deployed one to be returned. 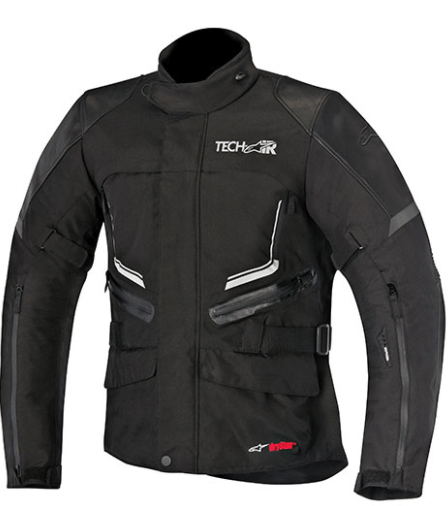 The tech air system is all weather proof when worn under a compatible jacket meaning it can be used in any type of riding on any kind of motorcycle or scooter. The two piece system consisting of jacket and airbag unit gives a rider the option of spacing out the high cost of buying both halves of the unit if they can’t afford it all at once. The Tech Air vest can’t be used in anything other than Alpinestars’ Tech-Air-specific ones or on it’s own like a Hit-Air airbag vest, but the jackets can be purchased first and worn without the airbag. Also as more compatible jackets come on the market down the road the rider won’t have to pay for the airbag vest portion again. Tech Air doesn’t use GPS to function like D-Air needs to. One less thing to need servicing on the positive, but it also means you can’t get information like average lap times, top speed and other data the GPS provides in the D-Air system. Battery life is 25 hrs continuous use before needing charging on Tech-Air! That is a huge amount longer than D-Air. I suspect the lack of GPS drain on the battery is the reason why, but I’m only guessing. 1 hour of charging provides 4 hours riding time. When I spoke to a service agent on the phone at Alpinestars in California I was told the Tech Air Street vest carries two deployment charges, meaning the vest didn’t have to be recharged unless it was damaged after only one deployment of the airbag.If this is true that’s another big advantage for buyers over D-Air which has to be sent away and recharged after every deployment.However, other reviews I read about Tech-Air said the system only is equipped with one deployment charge. There may be some mud in the water when it comes to what exactly is available on the street version of Tech Air, because the Racing Tech Air system indeed does have two deployments built in. I suppose we will only know for sure when it officially comes on the market at the end of August 2017. Turning on the Tech Air system is accomplished by zipping up the zipper on the jacket. That’s it. No neck clasp to remember to do up like on D-Air. Keep It Simple, Stupid as the saying goes. Airbag systems have really become common in Europe and Asia, but not so much yet here in North America. Limited availability may be to blame mostly, but I suspect many riders don’t even know it’s an option unless they follow MotoGP closely. The amount of money needed may sound out of reach for many people when it comes to spending over $2000 on the Dainese or Alpinestars systems. Even at first glance, $650 for one like Hit-Air’s might seem too high as well. Consider the ramifications monetarily, physically and mentally speaking to your lifestyle from a significant injury- let alone death! Adding up lost wages along with the pain and suffering to you and your loved ones even if you recover fully can make the purchase price start to look a lot better. There’s a real possibility beginning to appear on the horizon where motorcycle airbags will be as common as helmets are with riders everywhere. There’s just too much mounting evidence showing what benefit they are to those who use them to continue ignoring. Once that day comes I would also guess government legislation to make airbags mandatory won’t be far behind. Why not just embrace it now instead of waiting?